FROM the days when monarchs over-borrowed for their mercantile adventures, to Argentina’s recent failure to pay its creditors, countries have long run into trouble paying back what they have borrowed. Spain’s 16th-century king, Philip II, reigned over four of his country’s defaults. Greece and Argentina have reneged on their commitments to bondholders seven and eight times respectively over the past 200 years. And most countries have defaulted at least once in their history. But what precisely happens when countries stop paying what they owe? When a country fails to pay its creditors on time, it is said to go into “default”, the national equivalent of going bankrupt. But sovereign defaults are quite different from business bankruptcies as it is far harder for creditors to repossess the assets of a sovereign entity than to repossess the assets of a company (an unarmed Argentinian naval vessel detained in Ghana for ten weeks in 2012 was an exception). In the first instance, to curry favour in international markets, defaulting countries tend to restructure their debt rather than simply refusing to pay anything at all. But these so-called “haircuts”, where the original value of a bond is reduced, can be much more painful for the holders of government bonds than a simple clip of the scissors. After its $81 billion default in 2001, Argentina offered to pay its creditors a third of what it owed—93% of the debt was eventually swapped for performing securities in 2005 and 2010. But the remainder, which is held by vulture funds and other investors, is still in dispute. These “holdouts” are waiting for $1.3 billion plus interest. And when Greece defaulted in 2012, bondholders were forced to take hits as high as 50%. In less severe cases, countries may choose to restructure their debt by requesting more time to pay. This has the effect of reducing the present value of the bond—so it isn’t entirely pain-free for investors. Some suggest that this is the right course of action for Ukraine as it struggles to balance its immediate domestic priorities against its obligations to bondholders. Defaults can also be very painful for the offending country, particularly if they are unexpected and disorderly. Domestic savers and investors, anticipating a fall in the value of the local currency, will scramble to withdraw their money from bank accounts and move it out of the country. To avoid bank-runs and precipitous currency depreciation, the government may shut down banks and impose capital controls. As punishment for default, capital markets will either impose punitive borrowing rates or refuse to lend at all. And credit-rating agencies will no doubt warn against investing in the country. But as history shows, in most countries yield-hungry lenders will eventually start lending again so long as they are adequately rewarded for the risk they are taking on. Moreover, credit-default swaps—financial instruments which act as a form of insurance against sovereign and corporate defaults—allow bondholders to hedge their risk. 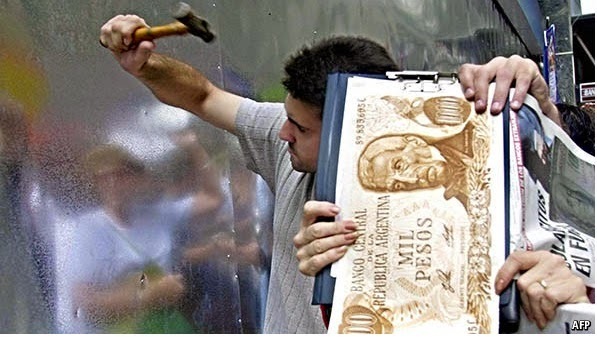 But not all defaults are the same: Argentina defaulted again this year by refusing to pay $1.3 billion plus interest to the “holdouts” from 2001. Critically, there is no international law or court for settling sovereign defaults, which helps explain why they are so varied in length and severity. More international regulation has been proposed—including powers to prevent minority holders from hijacking the process—but such conditions ultimately remain up to the issuing country. The first bond issuances since the new proposals (by Kazakhstan and Vietnam) include these clauses. Other countries might follow suit, but this doesn’t resolve the $900 billion of bonds outstanding that were issued under the old rules. Like any messy divorce, drawn out negotiations around defaults can be costly for all parties involved. Working towards better pre-nuptial terms might not be such a bad idea. Αναρτήθηκε από Unknown στις 7:04:00 μ.μ.